During our Circles of Safety training, we often ask participants, “Who is the first person you need to speak with when taking initial steps towards prevention?” The response we’re looking for is yourself! Participants almost never come up with this answer, yet, having the conversation with yourself is indeed a vital step in being able to responsibly, bravely and strongly prevent and respond to child sexual abuse. For many reasons, this conversation that we have with ourselves is not an easy one. The same barriers that exist in interpersonal communications about sexual abuse come up even in the complete privacy of our own thoughts. The “yuck feelings” arise, common to any mention of child sexual abuse, feelings like dread, shame, confusion, fear, anger, and guilt. 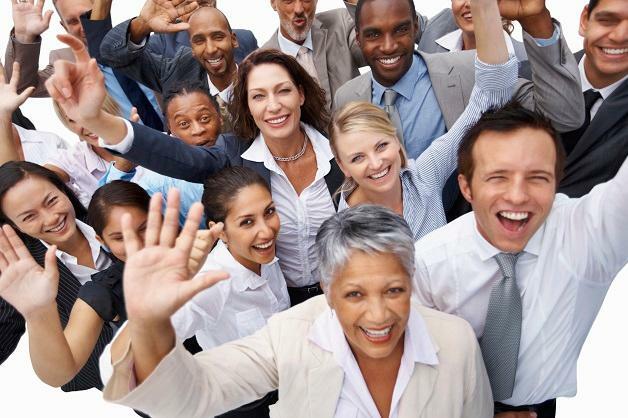 As bystanders, we may question our own observations and instincts – “Did I really see that?”. As caregivers, we often feel shame for not “seeing something earlier” or “doing something sooner”. As concerned family members and neighbors, we want to know how speaking up will impact our relationships. Survivors wonder if they’ll be safe. Adults looking for help for themselves wonder how their lives will change. And we wonder if we can really make a difference by speaking up. Regardless of our role to children’s sexual safety and to sexual abuse, asking ourselves tough questions about the next steps we think necessary and the steps we’re willing (and capable) of taking challenges us to reflect on our own experiences and relationships associated with sexual safety. Our own understanding of what is ok, what is healthy, and what is safe; our own course of sexual development; and our system of values and beliefs frame our personal reflections and the questions we’re asking ourselves. These internal conversations can be the doorway to taking protective actions – and they can support and guide the conviction, passion and courage necessary to take our chats with ourselves out into the open. When we are willing to ask ourselves the difficult questions, and look at our own feelings and thoughts about children’s sexual safety, we can begin preparations to move into conversations with others – to seek support, to learn more, to trust our instincts when we’re concerned and to develop plans to respond to a child’s need and right to be safe. 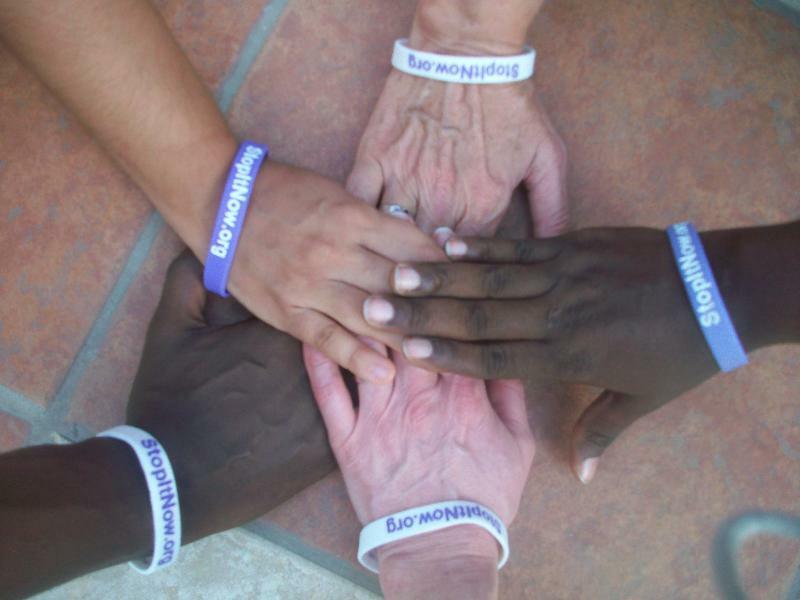 Along with many other violence prevention organizations, we at Stop It Now! are frequently contacted by reporters wanting to know what we – as a society – can do to prevent another Sandusky/Penn State case or another Nassar/USA Gym. We’re asked about warning signs of abuse, children’s healthy sexuality and how adults can talk to children about safety. While all of these are important and critical steps in prevention, today we’d like to invite you to focus on the necessary preliminary step that every adult concerned about children’s safety can do – having a conversation with yourself. While we are still completing our analysis of the 2017 Helpline use data, we wanted to share with you a few high level figures. Since the Helpline’s inception in 1995, we have now had over 21,000 conversations specifically on children’s sexual safety and in 2017, we had almost 1800 inquiries through our phone, email, chat and social media channels. We continue to hear from folks across the prevention spectrum from early safety planning to full immersion in the child protection system, however our largest audience continues to be those folks concerned about warning signs in children and adult’s behaviors or who are worried specifically about children’s sexual behaviors that could be harmful. Over 50% of Helpline inquiries come from a bystander who knows everyone involved – the child at-risk or who has been abused AND the person who is at-risk for abusing or who has already abused, highlighting the challenges of prevention when we know the faces of those who are involved. Whether people know an adult or child whose behaviors worry them or are seeking help for themselves, these situations are most often very personal and involve complicated relationships. We want to hear about what influences your thoughts on taking preventive steps to keep a child safe. Please take our anonymous and confidential, 1-question survey. 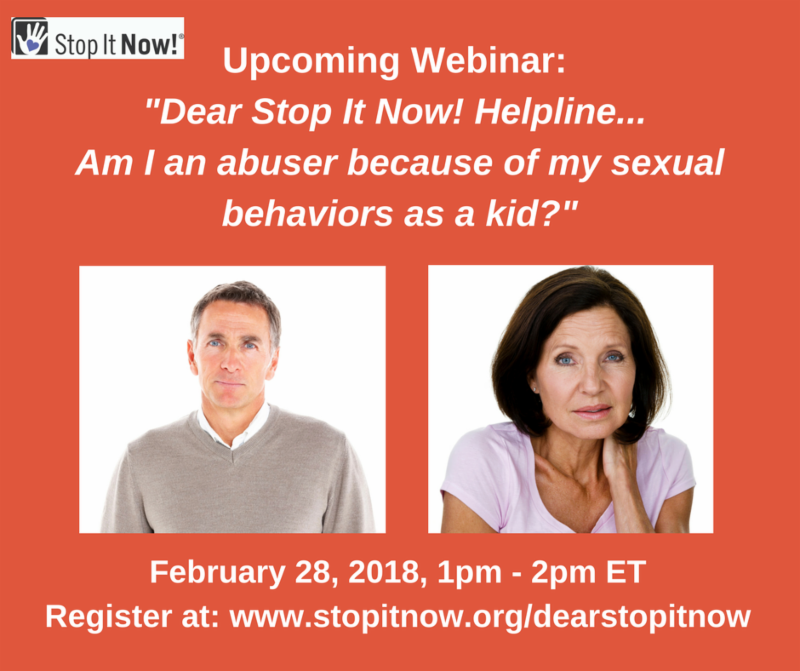 You’re invited to join us for the 4th webinar in the “Dear Stop It Now! Helpline” series, "Am I an abuser because of my sexual behaviors as a kid?" on February 28, 2018 from 1pm - 2pm ET. These webinars share safety planning information, practical tools and resources for child sexual abuse prevention through reviewing real letters to the Stop It Now! Helpline. For more info, visit www.stopitnow.org/dearstopitnow. A new exciting project is underway here at Stop It Now!. With help from Grant Consulting, the Smith College School for Social Work and Joan Tabachnick as consulting expert, we are beginning to dig deep into the data collected from the Helpline about the types of inquiries we get and the stories we hear. Funded through the Oak Foundation, this project will allow us to share our data analysis and, more importantly, use these real stories from the Helpline to help inform all of our conversations, particularly in public conversations happening in the media, in research and in any relevant clinical application. Stop It Now! joined national and international experts in signing a letter to Twitter, opposing the termination of non-offending anti-contact Minor Attracted Persons, understanding that prevention is actually side tracked when we reduce access and support to adults responsibly engaging in social media. Please read the letter and article by Jeremy Malcolm, internet lawyer and internet crime policy advocate: Experts, Police, and vigilantes Face Off Over Pedophiles on Twitter, as well as Vice’s article, Social Media Sites Can’t Decide How to Handle ‘Non-Offending’ Pedophiles. 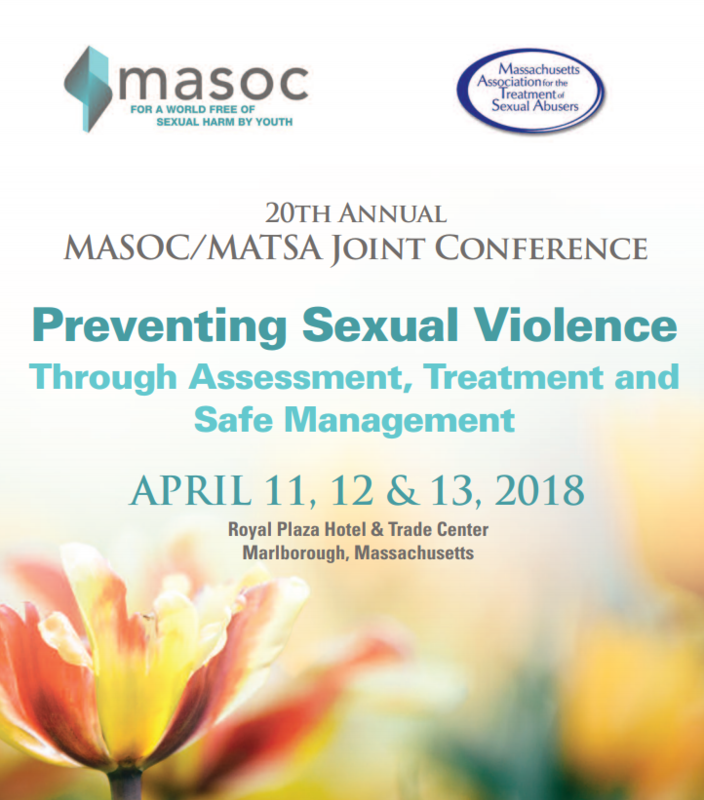 Consider attending the 20th annual MASOC/MATSA Joint Conference: Preventing Sexual Violence Through Assessment, Treatment and Safe Management, April 11-13, 2018. 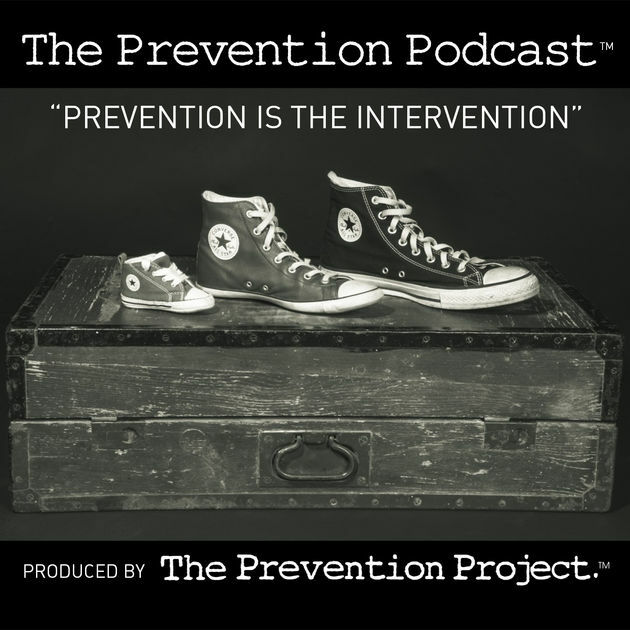 An exciting new project that shares educational podcasts for the global community on sexual violence prevention from the Prevention Project, which is a prevention-education effort addressing risky sexual thoughts, fantasies, and non-contact problematic sexual behavior in adult men and women.